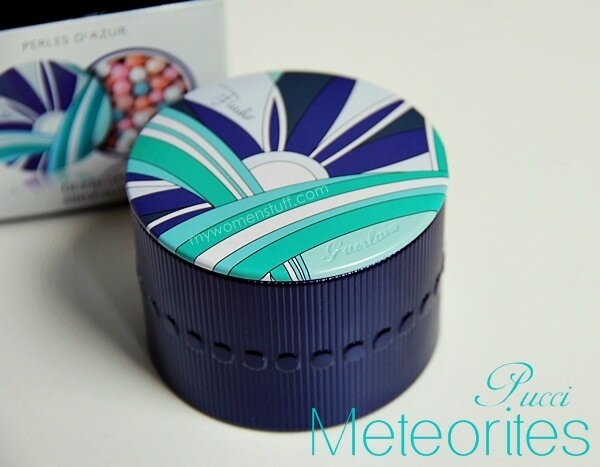 If you are familiar with the fashion of Emilio Pucci, you will recognise the design on the cover of the Meteorites tin, and on the inside of the box. 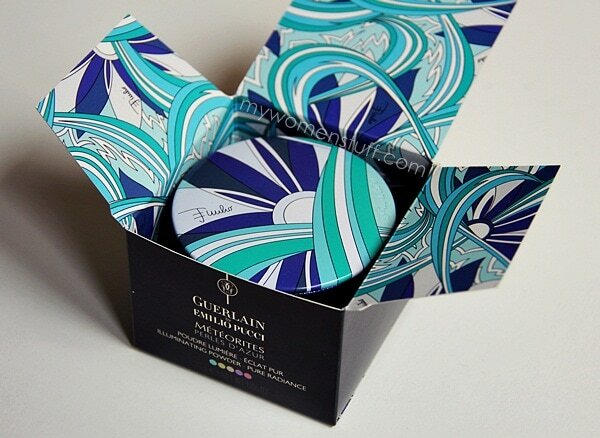 The whole Terra Azzurra collection bears this very pretty design on the inside of the box. I will get one complaint out of the way about this particular item. I wish Guerlain had gone with a deep blue sponge for the inside, as opposed to white. As you see on the right of the picture above, the colours of the balls, particularly blue and orange, mark the sponge, and it looks diseased 😛 With the regular ones, its not so bad because the colours are lighter. With Perles de Nuit, they used a black sponge. I wish they’d done the same. I won’t toss the sponge though, because it keeps the balls from flying all over if I accidentally knock the tin over, or if I choose to travel with the tin. If you are more careful and don’t intend to travel with this, please feel free to toss the sponge. Here are the individual balls. Only 5 because I accidentally missed the light gold one. It is very similar in colour to the beige except there is a shimmer sheen so it was easy to miss. But as I said, you aren’t supposed to use it this way. The way to use Perles d’Azur and all Meteorites powders is to dip your powder brush into the pot, lightly swirl it around and then brush it on your face. It will auto-magically blend and give you a lovely illuminated gentle glow to the skin. There is absolutely no way to show you this, because it isn’t something you can capture on film. You will know it works, because your skin will have a glow to it, even though you may feel like crap. I have said time and again that I can’t live without my Meteorites pearls. Nope, I can’t. Its what helps me look alive when I feel dead in the water. So how is Perles d’Azur different from the regular Meteorites loose pearls and do you need it? I’ll address the “need” part later but how is it different – good question. Here is a group shot of the 4 tubs of Meteorites pearls I presently own for comparison purposes. I’d say that Perles d’Azur has slightly warmer tones than Teint Rose which is more for brightening. It is quite close to Teint Beige, but a little more shimmery. If compared with Perles de Nuit from last Christmas, I find Perles de Nuit more shimmery and more beige in tone. Perles d’Azur is noticeably warmer on skin thanks to the orange but does not look as shimmery on skin. Do you need Perles d’Azur? I’d say that if you aren’t a collector or a fan of Guerlain Meteorites, and already own one tub then no. You do not need this. It is probably just like the one you already own, just slightly warmer. You can wait for something more special perhaps. 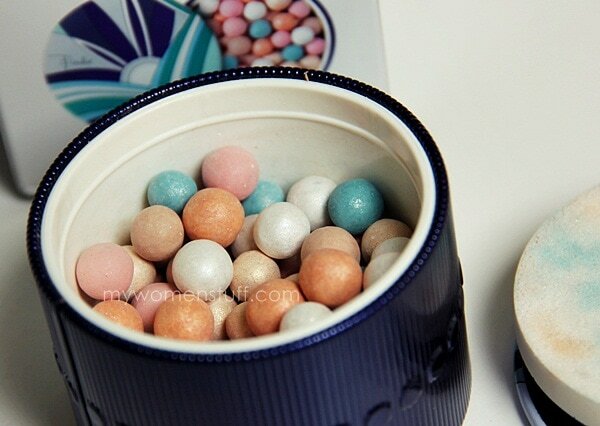 Perles d’Azur is the limited edition Guerlain Meteorites loose pearls illuminating powder for Summer 2012 and is part of the Pucci collection. I find personally that Perles d’Azur has a warming effect on my skintone. It isn’t a very obvious powder but it does give me a slightly healthier looking glow, as opposed to a brightening glow that I experience with Teint Rose or Perles de Nuit. It is quite shimmery but isn’t apparent on the skin so I find that I can be quite liberal about this and still not walk around looking like I fell face first in shimmer powder. All in all, I’d say that for a Meteorites fan, this is definitely one to add to your collection. If you are looking to get your first tub, check also the ones in the permanent range. 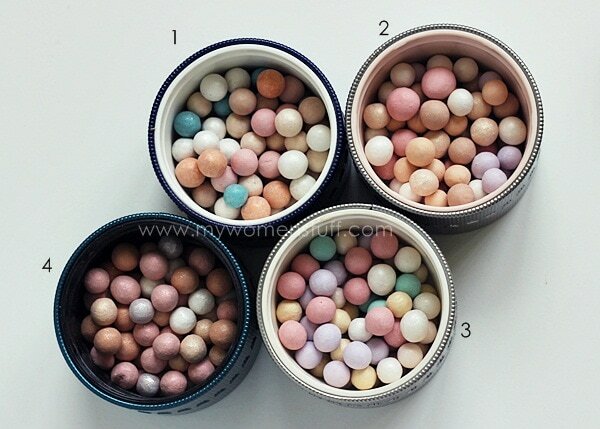 I have a trick to using Meteorites loose pearls (any one) and is this: You can tailor the colour/tint you want by simply shaking the tub. 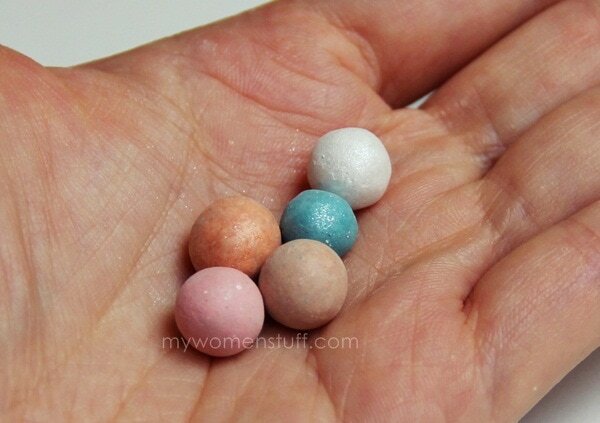 When you do that, the pearls mix up and you may find that there are, e.g. more blue and orange balls at the top. So, your powder that day will have a warmer tone but the blue will ensure you don’t look like you dusted orange powder on your face. On a different day, you may feel like you want something more muted but highlighted. So, bring the white and light gold balls to the top, and there you have it – a warm highlighter. As I have said, if you don’t own a Meteorites loose pearls powder, then, yes you may want to check this one out. If you have a warm skintone, you may seriously consider this one because of the warm tint. The packaging is gorgeous, and for summer, this is really perfect to add effortless luminosity to your skin. If you already own one and aren’t crazy about them the way I am, then pass. PREVIOUS POST: Diptyque in Malaysia : Simply Scent-sational! NEXT POST: Tip: Liquid foundation too thick or drying? Add a drop of moisturizer! I love mine and love the bit of healthy glow it gives. Nobody can beat Gueralin powders! And thanks so much for the link! I agree with you 100% Tracy! Guerlain powders can’t be beat! Love how Capri looks on you. I looked at the palette and knew it was a pass from me. I actually bought this one! I was going to resist, I have Mythic and never use it, but I loved the case and the warmness. I’ve already used it twice, actually. I don’t normally use highlighters or anything, but I use very matte foundation, so it helps to give it a little more naturalness. Oooh i think it’s a matter of time before i end up grabbing every single one in this collection! Just curious, do you use the brush that Guerlain says is specially for the meteorites? Is it a necessity? Am also wondering if this collection will be released on the 20th over here in the UK too.. Hmm..
Never, Sukie! I got these to make sure I don’t miss a meteorite and because I love the packaging too! 😀 I think it might be out in the UK already so I’d suggest you check in store soon so you don’t miss out! The packaging reminded me so much of Water Marbling (Nail art). I seldom get these types of makeup as they are quite bulky inside my train case, but I have to admit, you made me want one!!! Haha yeah, I’m a bebola collector 😀 Happy that you are liking the one you have. I love it when people like this too because I met some people recently who looked at these and said “what are these for? I saw nothing on my face” and they were supposed to be pros. Well I just sat there and held myself from falling off my chair. I just bought this yesterday! Initially I thought of dropping by Guerlain to make my reservation but I was told it’s already available :). I bought the brush too. Yay!! I hope you like this too! The brush is so pretty and that pouch! You could use it for something else too. It’s so pretty! I love it as much as my first can of “bebola” from the permanent range ;). I can’t believe that my first meteorites perles purchase and the Pucci one is just 1 month gap! Oh the brush is just for collection to go along with the Pucci Meteorites :). It’s not always that they have a LE brush on sale lol. I think I MIGHT pass, since I already have Teint Beige. But every time I look at those damn blue balls, my heart will melt. Sigh. Erm yes, guilty! 😛 I think if you have Teint Beige, you can hold out. It’s super pretty but not all necessary. I’m hoping against hope that they bring in a pink one. They made one a few years back that can be used as a blush, but I missed that. I didn’t own any meteorites yet. But I’m planning to buy one. It really do look tempting! But I don’t know which one should I get. The differences in the picture looks subtle too. the reason i had wanted this was for the blue balls and the lovely tin casing, but since it’s of a warmer tone… not for me already. i very much prefer a brightening glow, skin looking sallow these days, well I guess my money’s saved! Have a happy day Paris! Since it’s my first Guerlain adventure, I picked up the brush and purplish-blue mascara too. I am waiting for the purplish-blue nail polish which somehow was not shipped over. Skipped the bronzer because it is way to big and shimmery. I thought it would be a small one. But I must admit that the brush is not as smooth as my own. Aargh I have to stop reading about this collection because I’m so tempted! Warmed glow totally sounds like my thing, and I don’t own any of these yet so I can justify the purchase riiiight? That Pucci design is gawjus! But I’ll take your advice and check out the others first. Thanks for the review-awesome stuff as always! 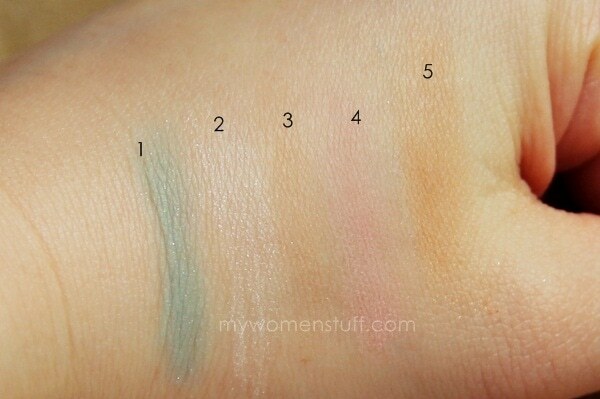 i swatched both this and the tient rose on my hands but i couldnt tell any difference…didnt see the magical glow!!! looks like regular finishing powder to me….and i swear i looked very very hard..under natural light, indoor outdoor…cant see! is it that i must do it on my face? i wanna see the magical glow!!!! ahhh…thats the reason i cant see it! hmmp, the brush they used at the counter seemed dirty..and streaky..